At the beginning of January we were contacted by Boohoo and asked if we would like to collaborate on a resolutions post. 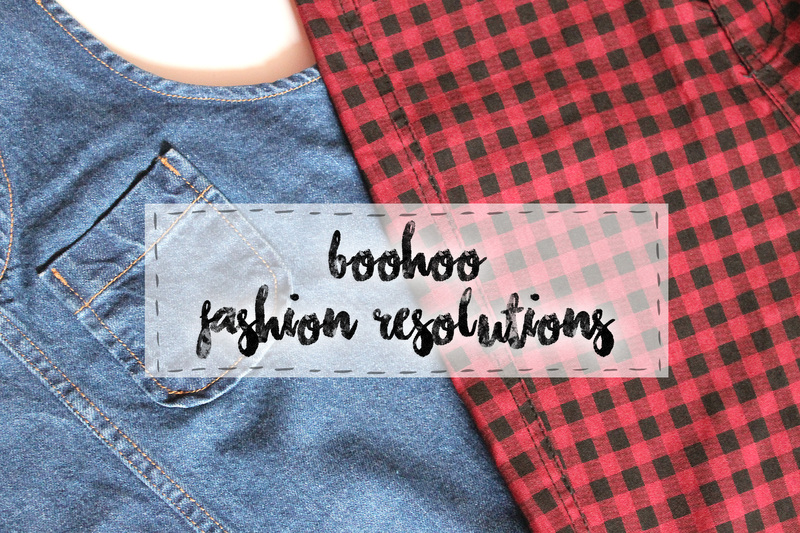 Every year the majority of people make resolutions they can’t keep, so Boohoo decided to give bloggers the chance to make a resolution they’d hopefully stick to! They kindly gifted us an item each that we wouldn’t normally go for but wanted to try and style. So here are the pieces we chose, let’s hope we can stick to this resolution! I’ve always been a fan of patterned trousers but I’ve never been brave enough to buy myself a pair. This was the perfect opportunity to get myself some and try something new, finally! 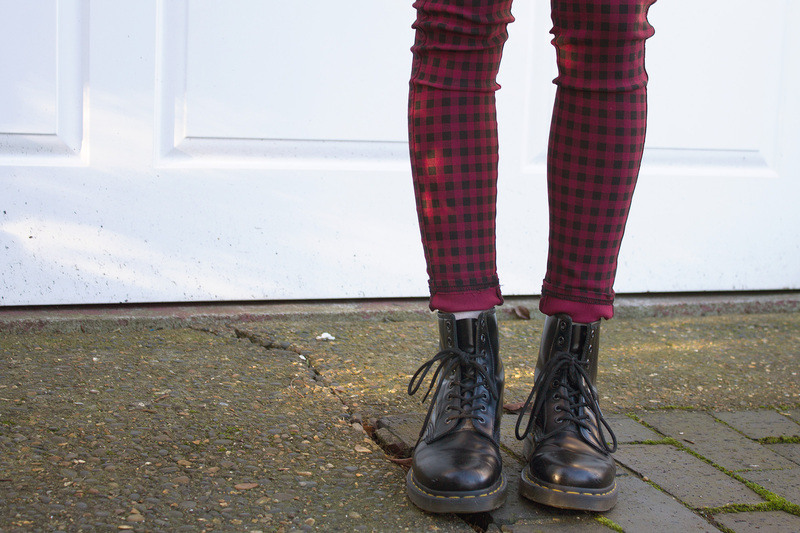 I love the red and black check design, they’re also high waisted which is something I like my trousers to be. I’d say the material makes them feel more like thin trousers than jeans but regardless of this I love them! 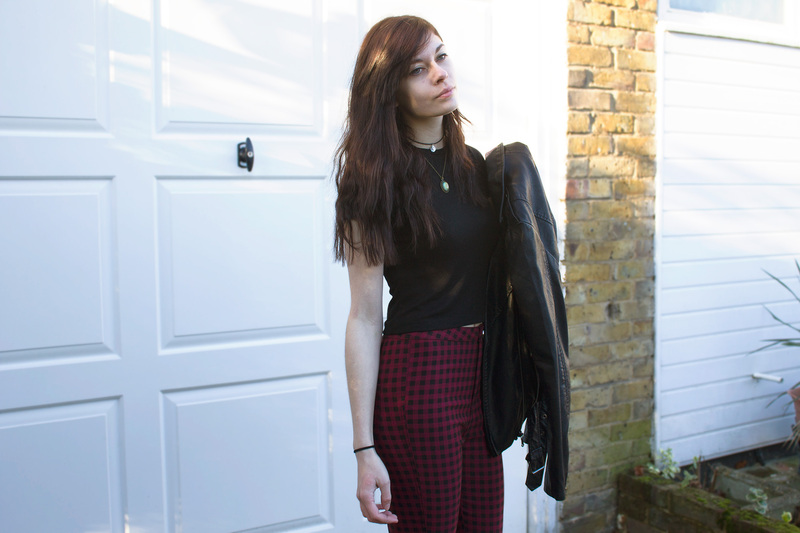 I styled the trousers with a black cropped tee, black Doc Marten boots and a faux leather jacket. I like how it looks kind of, ‘edgy’ I guess? I own a lot of plain tops which can look a little bit dull with normal jeans but I love how these ones change it up a bit, meaning I can get away with wearing boring tees with them! If you want to try some trousers like these on Boohoo, I’d suggest you probably get a size smaller than you are. I got mine in my usual size but didn’t realise they’d come up a bit bigger, meaning I spend a lot of time having to pull them up to feel comfortable. The quality of the trousers is good, although as I said, they are quite thin but I personally don’t mind that at all. The only problem I have noticed is that the button is quite loose on them. Despite this I am seriously in love with these jeans and I’ll be looking on the Boohoo website to see if they have any others like them! You can find these for only £25 and if you’re not too keen on the red, they do them in khaki as well! 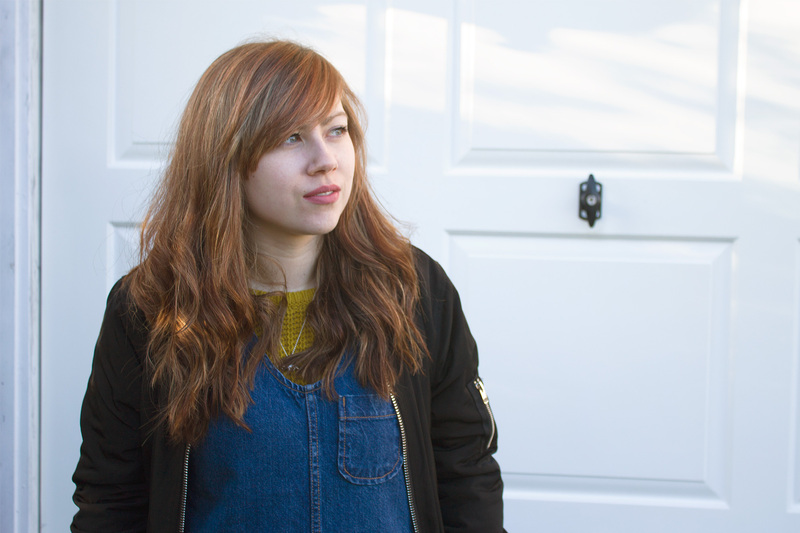 So for a few years now I’ve really wanted to buy a denim pinafore. I’ve tried on so many different styles but have never found one that suited my body shape, so they never made their way to my wardrobe! I decided to have a little search on Boohoo and see what I could find and I wasn’t disappointed! 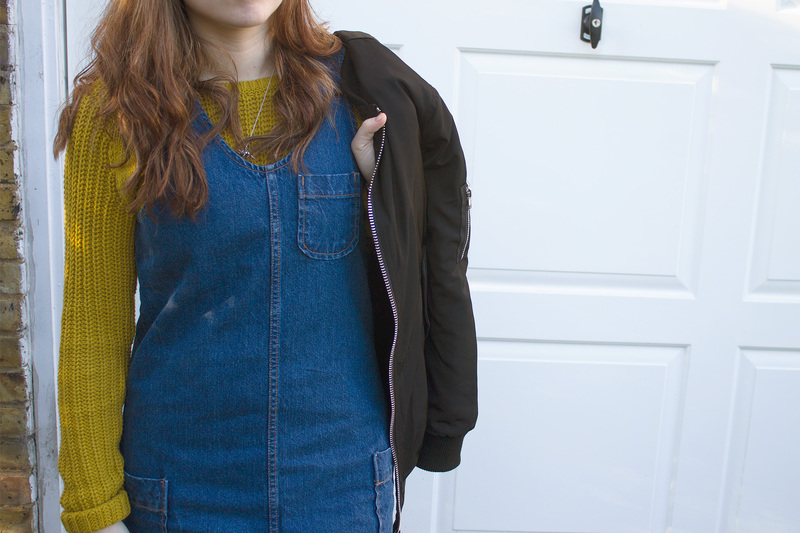 I had a look at the Fiona Denim Dungaree Pinafore and it is something I’d never usually go for, but hey that’s the whole point of this post! This Boohoo pinafore is unlike any others I have seen! I love the V neck and the fact that it’s a shift style dress so that I can fit huge jumpers underneath in the colder weather. The pockets on the front and sides are great additions too. It fits like a dream and is so comfortable compared to any other pinafore I’ve tried on. I’m also super impressed with the quality of this dress and it has that real denim feel about it. Going with the theme of trying something new, I popped this huge mustard/green jumper underneath. The majority of my wardrobe is black so for me trying something this colour is a big deal. I decided that jacket wise I’d wear this long line bomber that I recently purchased from Boohoo. I’ve purchased so much from there recently, they have some lovely pieces online and they’re super affordable! 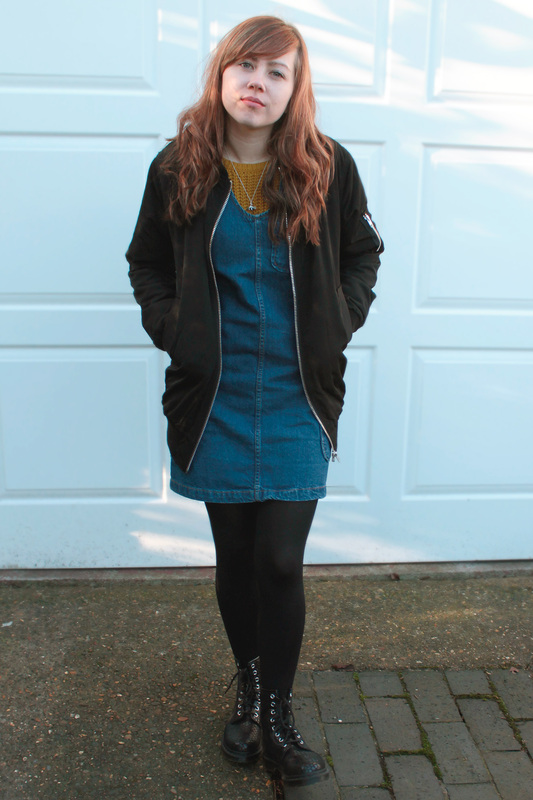 Of course any outfit post on our blog wouldn’t be complete without a pair of docs. 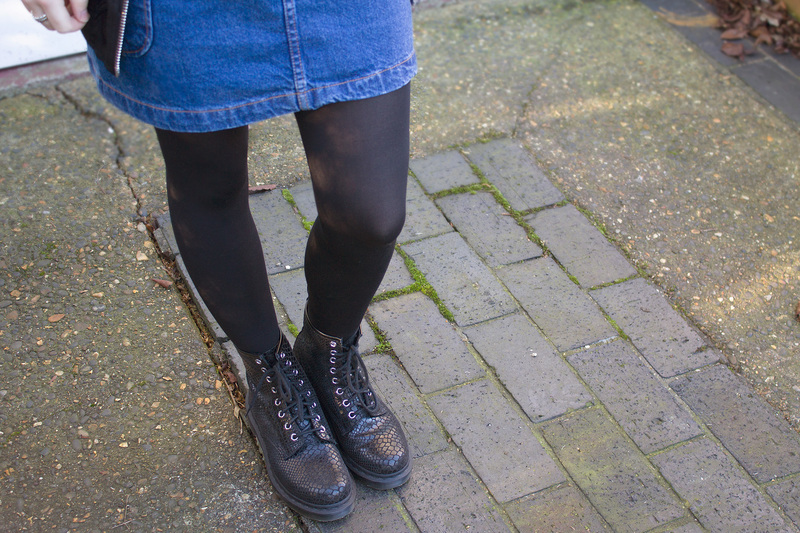 I’m loving textures lately so these snake print docs I got for Christmas go perfectly with my pinafore! If you’re interested in purchasing this pinafore for yourself then you can find it online for £12 in the sale, absolute bargain!!! I decided to get this in a size 6, it’s got quite a lot of room though which is perfect for big jumpers. If you’d like to find either of the items we were gifted you can find them on the denim section of Boohoo’s website! We’re so happy we’ve actually tried something different and we know already that these items are going to get plenty of wear! 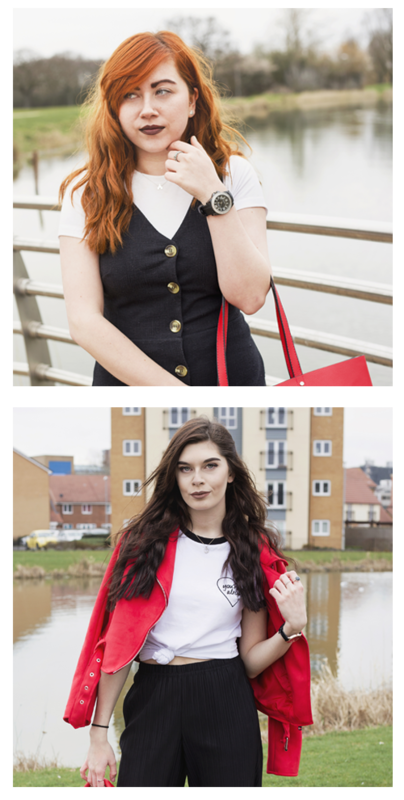 Thanks to Boohoo for wanting to collaborate with us, it’s the most exciting thing to happen to our blog so far! *This post is a collaboration with Boohoo and all opinions are our own. Oh I love the first outfit so much. 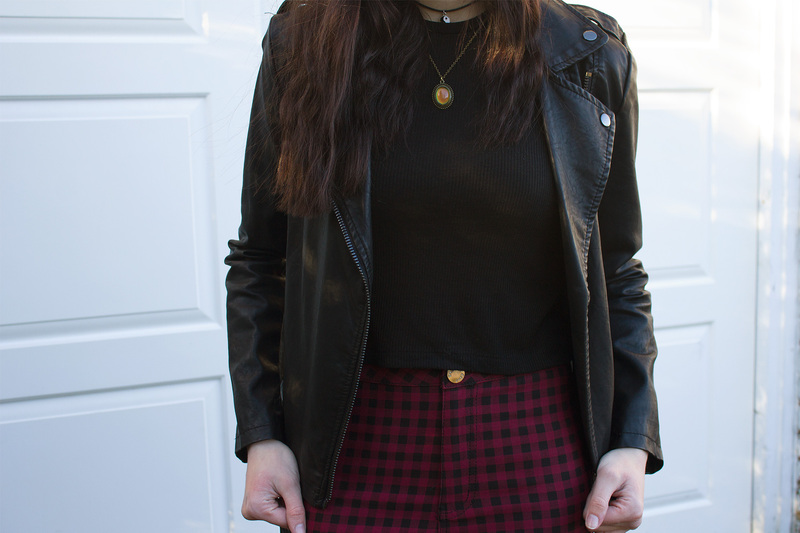 Tartan and plaid is my absolute favourite pattern and Doc Martens are my favourite shoes! I love Lauren’s hair and shoes as well. Gorgeous photos lovelies! 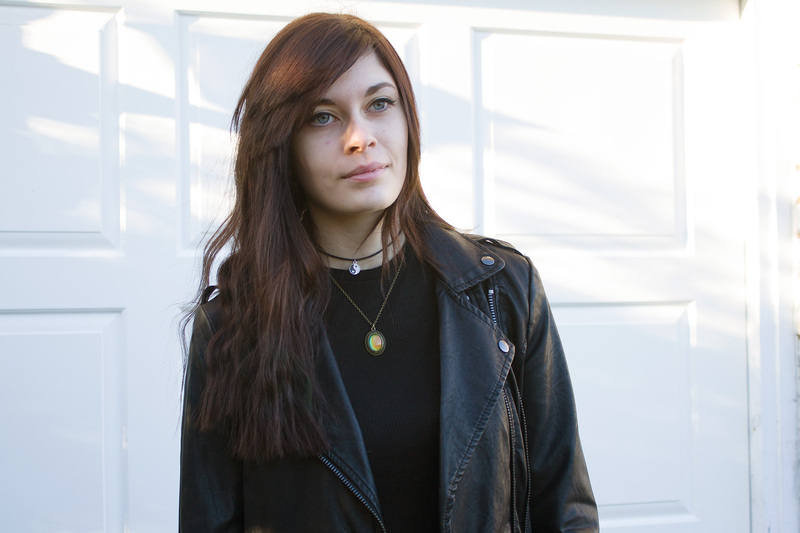 Lauren – you can definitely take good pics! Awww girls !!! You both look absolutely stunning ! I can’t decide what I like best .. The patterned trousers are SO gorgeous .. 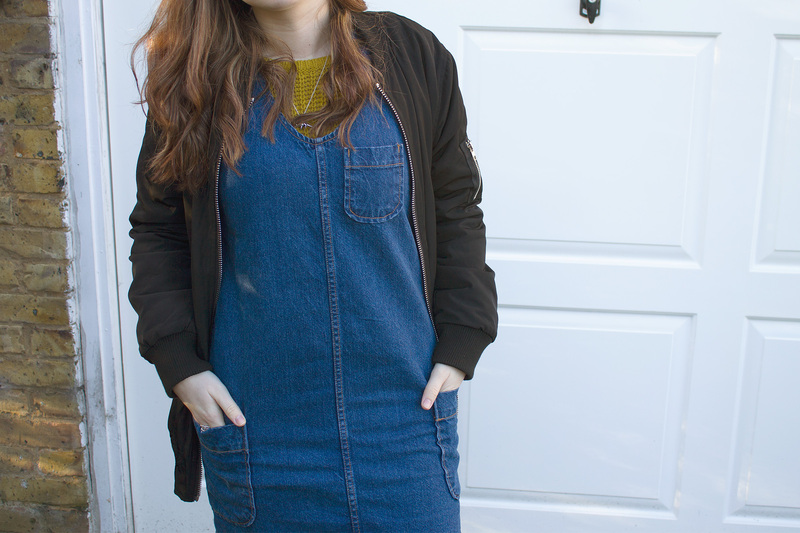 But I am also in love with the denim pinafore !! Fab post loves .. You definitely rocked both items ! Thumbs up for trying something new ladies! All of us should do that once in a while. So many people always say ‘awh no I don’t think that will look good on me’ or ‘no, I can’t pull that off’. HOW DO YOU KNOW WITHOUT TRYING IT ON! Love the items that you picked. Especially the skinny jeans. I adore that print. I love this post and adore what you are both wearing, you both have such style! Well done for trying something a bit different!